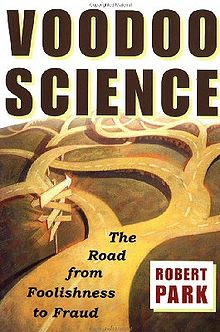 In his book; Voodoo Science: The Road from Foolishness to Fraud, author Robert Park describes the studies of science and, as Park so aptly names it, "voodoo science," as well as the line where one crosses over in to the other. The book is written mostly in layman's terms, making it friendly and understandable for non-scientists, the audience that this information should most benefit. Park brings up many topics having to deal with science, voodoo science, and where they overlap, including how both science and voodoo science are displayed in the media, how people understand each, using science to determine the difference between truth and pseudoscience, placebo effects, space travel and aliens, perpetual motion and free energy, and superstitions. He covers each of these topics in detail, explaining what about each is science and what is voodoo science, and using scientific methods to "debunk" these pseudoscience beliefs. My personal favorite part of Voodoo Science was the chapter on superstitions and false beliefs, both modern and ancient, and how they relate to pseudoscience. This chapter also goes into parapsychology, and people dealing with things they do not understand. The part of this chapter that interested me most, however, was that having to deal with Deepak Chopra's use of quantum mechanics as a pseudoscience. As a man who has always loved the study of physics and how we can use it to understand the universe, I have always been fascinated with quantum mechanics; quarks and blacks holes, time travel, etc, all grounded in true science. Chopra used this fascination to her advantage and wrote two best-selling books about how quantums can cure illness and stop aging, (mis)quoting physicists like Stephen Hawkings to give herself credibility. The public ate it up, trusting her (she quoted Stephen Hawkings after all! everyone knows hes a genius!) because it sounded scientific, and everything scientific is right, right? Well, that's the problem with voodoo science. Many of the topics covered in Park's book coincide with those from class, such as the definition of science and pseudoscience and of course many of the subtopics involving this. One particular topic that relates to class especially is the placebo effect. In class we learned about the Q-ray bracelet, a supposedly ionized bracelet which could help alleviate pain and give us strength and balance just by wearing it. There is no real science behind this bracelet, however: it works entirely on the placebo effect. People THINK that the bracelet will help them, so they feel like it is. This idea, the placebo effect, is covered in more detail in Voodoo Science. Overall, Voodoo Science: The Road from Foolishness to Fraud is a great book, because it does what Robert Park set out to do: educate the uneducated on "voodoo science." Books like these are a great step in the right direction, as bringing knowledge to the public and exposing scams for what they are can help society as a whole. From moving on from false beliefs and pseudoscience, to preventing the wasting of money on fraudulent voodoo science products, books like these can help us all start believing in real science and move down the road of progress instead of foolishness and fraud. The following video is a bit outdated, but it deals with the increasing belief in voodoo science and the decrease in students going for scientific or mathematics degrees; the main problem which Park's book is out to solve.